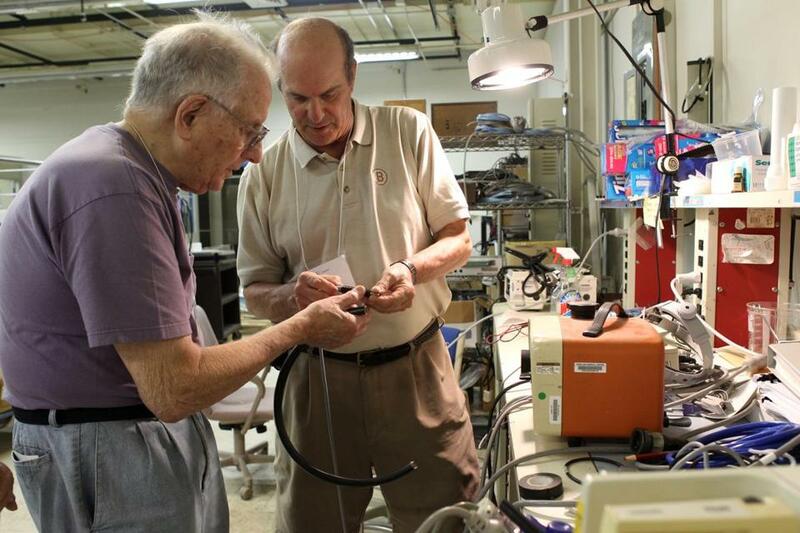 Fred Greenberg (left), a sound contractor, and Jay Gooze, an ophthalmologist, both of Durham, N.H., try to repair an optical unit so that it can be sent overseas. Trucks might have hauled away the last materials bound for Mirebalais National Teaching Hospital this summer, but the 5,000 volunteers at the International Medical Equipment Collaborative’s vast facility in North Andover haven’t slowed down one bit. Because health facilities in developing nations desperately need medical equipment, volunteers here are constantly testing, sorting, and packing donated items. One day in July, a retired physician pored over microscopes. A nurse helped out on her day off. A husband and wife in their 90s packed small boxes of nursing supplies. Through such team efforts, the collaborative last year completed 76 projects in 18 countries from Armenia to Madagascar. For the past two years, more than 1,000 local volunteers also have been handling construction materials, from pipe fittings to steel doors, to build a world-class hospital in rural Mirebalais, Haiti. The equipment collaborative was launched in 1995 when Thomas Keefe, a retired hospital administrator from Methuen who serves as the nonprofit’s president, saw an opportunity. Health facilities in the United States were upgrading machinery and tools every year. Why not send the older equipment abroad to clinics that would use it immediately? Now the organization increasingly sees its mission in terms of both health and sustainability. Its year-old Global Green Program promotes recycling of medical hardware through donations that quickly reach the developing world.